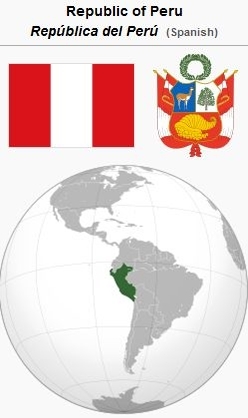 The Republic of Peru is located in western South America, bordered on the north by Ecuador and Colombia, on the east by Brazil, on the southeast by Bolivia, on the south by Chile, and on the west by the Pacific Ocean. It has an area of 1,285,216 km2 (496,225 square miles). Peru had an estimated population in 2010 of 29,496,000, with the following demographic breakdown: Amerindian 45%, mestizo (mixed Amerindian and white) 37%, white 15%, and other 3%. In the 2007 census, 81.3% of the population over 12 years old described themselves as Roman Catholic, 12.5% as Evangelical, 3.3% as of other denominations, and 2.9% as non-religious. As a result of the merger between Mennonite Brethren (MB) and Krimmer Mennonite Brethren (KMB) in 1960, the Mennonite Brethren Board of Missions and Services (BOMAS) assumed responsibility for the work in the eastern jungles of Peru begun by Krimmer Mennonite Brethren missionaries some 10 years earlier. In 1987 this work continued in association with Wycliffe Bible Translators, Swiss Indian Mission, and the South America Mission. Mennonite Brethren missionaries worked in the areas of Bible teaching, literature, agriculture, community development, and public health. They lived in Pucallpa, Mazamari, and Satipo. About 25-30 village congregations resulted from this ministry among the Campa Ashaninca people. In 1986 the independent Association of Ashaninca Evangelical Churches was organized. In 1983, Mennonite Brethren Missions and Services responded to a flood disaster in northern Peru by sending food, medicines, and mission workers. This led to the formation of several Bible study groups and in 1986, the Mennonite Brethren Church of Peru was officially recognized by the government of Peru (Iglesia Evangélica de los Hermanos Menonitas del Perú). Two congregations with total membership of about 60 were organized in Sullana and Vichayal. More missionaries were preparing to join this work. In 2003 there were twelve congregations with 215 members. Central Intelligence Agency. "Peru." The World Factbook. Web. 8 November 2010. https://www.cia.gov/library/publications/the-world-factbook/geos/pe.html#People. Martens, Phyllis. The Mustard Tree. Fresno, CA: Mennonite Brethren Board of Christian Education, 1971: 198-203. Mennonite Brethren in World Mission, 2, no. 4 (July/August 1986): 3. Mennonite World Conference. "Mennonite and Brethren in Christ Churches Worldwide, 2009: Latin America & The Caribbean." 2010. Web. 28 October 2010. http://www.mwc-cmm.org/en15/files/Members 2009/Latin America & the Caribbean Summary.doc. [Broken Link]. Mennonite World Conference. "MWC - 2006 Caribbean, Central and South American Mennonite & Brethren in Christ Churches." Web. 20 October 2008. http://www.mwc-cmm.org/en/PDF-PPT/2006carcsam.pdf. [Broken Link]. Missionary Messenger, 62, no. 12 (April 1986): 1-3, and 63, no. 9 (January 1987): 21. Toews, John A. History of the Mennonite Brethren Church, ed. A. J. Klassen. Fresno, CA: Mennonite Brethren Board of Literature and Education, 1975: 429-31. Mennonite World Conference. World Directory = Directorio mundial = Répertoire mondial 2012: Mennonite, Brethren in Christ and Related Churches = Iglesias Menonitas, de los Hermanos en Cristo y afines = Églises Mennonites, Frères en Christ et Apparentées. Kitchener, ON: Mennonite World Conference, 2012: 27. Ens, Harold. "Peru." Global Anabaptist Mennonite Encyclopedia Online. May 2014. Web. 19 Apr 2019. http://gameo.org/index.php?title=Peru&oldid=122816. Ens, Harold. (May 2014). Peru. Global Anabaptist Mennonite Encyclopedia Online. Retrieved 19 April 2019, from http://gameo.org/index.php?title=Peru&oldid=122816. Adapted by permission of Herald Press, Harrisonburg, Virginia, from Mennonite Encyclopedia, Vol. 5, p. 698. All rights reserved. This page was last modified on 4 June 2014, at 07:00.